In 1998, South Korean president Kim Dae-jung came to power with a “Sunshine Policy” attempting to reconcile with North Korea. That policy included providing badly needed economic aid to relieve North Korea as it recovered from a devastating famine. However, on the eve of a key peace conference in Panmunjom, a North Korean submarine on a spying mission got entangled in fishing nets and its crew committed suicide when South Korean ships began towing it back to port. Surely, given the overture and assistance provided by President Kim, the regime in Pyongyang would tamp down on its armed infiltration missions on South Korean soil? But the North Korean government has always operated by its own unique internal logic, and just six months later, its political insecurities would lead to the deaths of several men in a flash of cannon fire off the southern coast of Korea — exposing another curious tale of espionage and subversion. 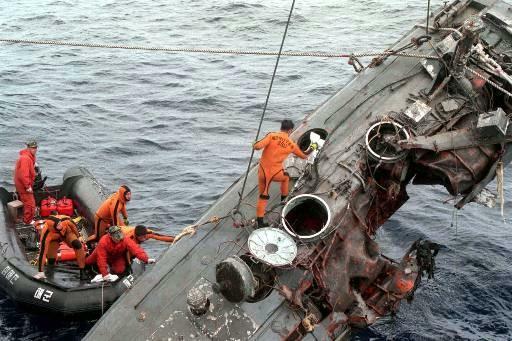 North Korea had lost two submarines in September 1996 and June 1998 while attempting to insert or exfiltrate Special Forces agents on espionage missions in South Korea, both incidents ending in tragedy. If there had been any hope that the embarrassment provoked these incidents would bring an end to the submarine missions, it should have been tempered by the discovery on July 13 of the body of a North Korean diver washed up on the beach at Donghae, South Korea. Apparently having suffered a heart attack, the diver was packing a Czech submachine gun, an underwater camera and a radio transmitter. An aluminum submersible vehicle was found nearby. Then in November, South Korean patrol boats spotted a mini-submarine off the coast of Ganghwa Island, on the northwestern border between North and South Korea. The submarine withdrew when South Korean ships attempted to intercept it. But whereas these earlier incidents occurred relatively close to the demilitarized zone separating the two Koreas, 1998 would end with an exchange of fire off the Yeosu peninsula, at the southern end of South Korea. At 11:15 p.m. on the evening of Dec. 16, a guard post spotted with infrared cameras a low-riding vessel with an “antenna” gliding through the water. Five minutes later, two ROK Navy patrol boats were dispatched to the area while harbor traffic was brought to a standstill. But the patrol boats could not locate the stealthy vessel. Abruptly, at 1:40 a.m., radar detected a ship zooming at around 50 miles per hour only five miles away from shore. As many as a dozen South Korean vessels moved in pursuit of the contact, soon joined by three navy P-3 Orion maritime patrol planes. Finally, at 4:38 a.m., the Pohang-class anti-submarine corvette Gwangmyeong identified the vessel as a North Korean I-SILC semi-submersible. The 10-ton Improved Submersible Infiltration Landing Craft looks like it belongs in a James Bond movie. Basically a nearly 13-meter-long low-riding motorboat coated in anti-radar paint, it can submerging three meters deep while under power, exposing just the crew cab and a folding snorkel mast (likely the “antenna” observed by the guard post). Unlike an earlier predecessor captured in the 1980s, however, the I-SILC can fully submerge 20 to 25 meters deep to avoid detection, but lacks an electric motor to swim underwater. Though later types can fire lightweight 324-millimeter torpedoes, the boat intercepted off Yeosu had no other weaponry other than the small arms carried by the crew. One of the orbiting P-3 patrol planes dropped flares in the vicinity of the boat, allowing four pursuing South Korean corvettes to close in upon it. As the spy craft fled south, approaching Japanese waters, the South Korean Navy notified the Japanese Self-Defense Force, which mobilized its own patrol vessels to observe the chase. An hour later, the boat slowed down when it was roughly 60 miles south of Geoje Island. Perhaps it was running out of fuel, as it is estimated to have a range of 230 miles, implying it required pickup by a mother craft. One of the South Korean corvettes fired warning shots off the semi-submersible’s bow. The infiltrators on board opened fire with a machinegun at their pursuers. One of the 1,300-ton corvettes then raked the motor boat with its 40-millimeter antiaircraft guns and blasted a chunk out of its port side with a 76-millimeter rapid-fire cannon, causing the ruptured submersible to sink in waters 300 feet deep. You can see the damage inflicted on the small craft in this photo. The body of a single diver in a wetsuit was recovered at sea. South Korea issued a red alert order and searched for possible infiltrators deposited on its soil, as had occurred in the Gangneung incident. The Defense Minister demanded Pyongyang apologize, but North Korea denied any involvement. Observers on the South Korean side could only speculate why North Korea continued to send armed infiltrators on obviously risky missions into South Korean soil, despite the Sunshine Policy. Some speculated that factions in North Korea were looking for ways to make the policy fail. Another theory was that North Korea favored submarine insertion over safer methods of infiltration because it helped its military refine infiltrations tactics it planned on using in the event of a full-scale war. The wreck of the semi-submersible craft was finally located on Jan. 20, 1999, and salvaged in mid-March. The bodies of two more crew members were found inside, one of whom bore a South Korean identity card and passport naming identifying him as Won Jin-wu. He also had computer diskettes, a million Japanese yen, ampoules of poison, rolls of film and a bag of cookies from a bakery in the Bongcheon district of Seoul, along with a rental contract for an apartment in that area. They also found a journal that listed the names and phone numbers of 12 South Koreans in touch with North Korean intelligence. According to Han Ki Hong of Daily NK, Won Jin-wu was an experienced spy with a record of posing as a Southeast Asian businessman. He had been dispatched to make contact with a group of South Korean supporters of the government in Pyongyang known as the National Democratic Revolutionary Party, after the group’s former leader, Kim Young-hwan, had publicly turned against North Korea. Won Jin-wu had appointed South Korean Ha Young-ok to assume Kim’s responsibilities, and trained him on how to stay in contact with his handlers. The submarine detected in November, it turned out, had actually been attempting to bring Ha to North Korea for training before it was chased away. Instead, Ha and his colleague Sim Jae-chun helped reconnoiter a pickup spot off of Yeosu and delivered Kim Jon Wu for exfiltration the next month. What had been the main objective of Kim’s mission in South Korea? Reportedly, to ask Ha to persuade their former leader Kim Young-hwan back into the fold with Pyongyang, thus reinforcing the image of a Kim Jong-il who had only recently fully established his control of the North Korean state. Yet again, North Korean spies had chosen to go down guns blazing rather than surrender. The incident of Yeosu also indicated how deeply naval infiltration and covert operations were integral to North Korean military and political doctrine. As usual, the loss of life at Yeosu did not seem to inhibit future aggressive actions. Indeed, six months after the “Battle” of Yeosu, a more sizable battle would be fought between South and North Korean patrol boats off Yeonpyeong Island that would leave more than a dozen dead, followed by an even costlier second battle in the same area three years later.